We are sorry to report the loss of one of our beloved retirees. 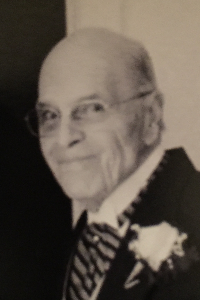 L. René Rochefort, 95, of Fairhaven died November 17, 2018 at Alden Court Nursing Home. He was the husband of the late Alice M. (Limacher) Rochefort. Born in New Bedford, the son of the late Adelard J. and Anna M. (Tremblay) Rochefort, he lived in New Bedford most of his life before moving to Fairhaven. Mr. Rochefort was formerly employed by the New Bedford Police Department for 35 years retiring as Captain in 1988. He served in the U.S. Army, 709 Military Police, during World War II. Survivors include his son, David R. Rochefort and his wife Cynthia Brown of Marion. He was the brother of the late Claire Forand. His Memorial Service will be held on Thursday at 11 AM in the Saunders-Dwyer Mattapoisett Home For Funerals, 50 County Rd. (Rt. 6), Mattapoisett. Burial will follow in Sacred Heart Cemetery. For directions and guestbook, please visit www.saundersdwyer.com.